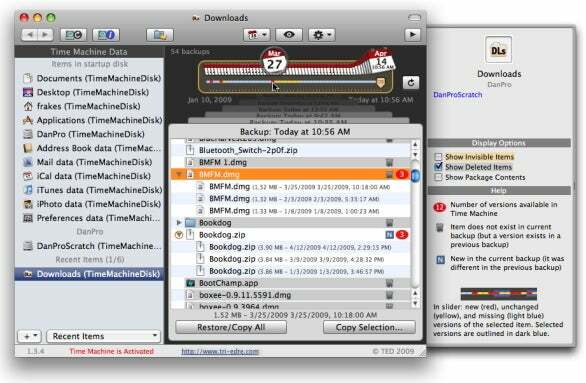 One of the most compelling features of Leopard is Time Machine, OS X’s built-in backup system, but it’s not without its limitations. As with much software, once I started to use Time Machine regularly, I began wishing it was more flexible and capable—specifically, in how it lets me browse and recover files. Tri-Edre’s Back-In-Time is a useful utility that aims to address these shortcomings by providing a very different interface for accessing Time Machine backups. The most-obvious difference is that, as a standalone program, Back-In-Time doesn’t require you to exit the standard OS X interface to access your backups. To view the backups of a particular file or folder, you just drag the item into the program’s window, select a folder or data type from the program’s list of favorites and recent items, or click on the Open Folder button to navigate to the desired folder. The browsing options differ, as well. For a given folder, the program shows you a Time-Machine-like view of the state of that folder at the time of a particular backup. But Back-In-Time’s display also indicates how many versions of each item exist in your Time Machine backups, which items first appeared in the chosen backup, and which items have been deleted sometime since the chosen backup. If your backups contain multiple versions of a file, you can quickly view (and restore from) a single list of all those versions, instead of having to “go back in time” for each version, as required by Time Machine’s standard interface. You can also browse, and recover data from, Time Machine drives from other Macs, as well as from previous Time Machine disks; and Back-In-Time provides options for viewing invisible items as well as for browsing OS X package/bundle contents. A nifty color-coded timeline shows you, for each file, when a new version of a particular file appeared in your backups. Moving your mouse over this timeline shows the date of each backup; click on a date to view that backup. As with Time Machine, Back-In-Time supports Quick Look previews of supported file types. You also get more options for restoring files. For example, you can restore to any folder on your hard drive—Time Machine requires you to restore to the original folder location—using the restore function or, even easier, by simply dragging files from the Back-In-Time window to the Finder. (You can also drag a file from the Back-In-Time window to an application to view that document; however, if you make changes, you’ll need to save the modified file elsewhere.) You can also restore multiple versions of a file simultaneously; Back-In-Time can even append the backup date and time to the name of each restored file, although this feature isn’t as clear as it could be. 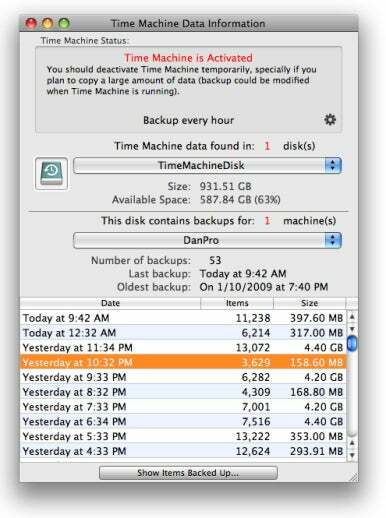 A handy Time Machine Data Information window shows you detailed information about each Time Machine backup drive, including a list of the drives for which it contains data and a history of each backup—when it occurred, how many items were backed up, and the total size of that backup. You can even view a list of files in a particular backup, although it takes a while for Back-In-Time to generate this list. The Information window also lets you adjust the Time Machine schedule so backups occur more or less frequently. Finally, Back-In-Time provides more options for removing data from your Time Machine backups: Select one or more items and choose the Remove command, and Back-In-Time lets you choose to remove just the current versions, all versions, or all versions from the chosen backup—the one you’re browsing—back to a particular previous backup. One downside to Back-In-Time is that its performance feels noticeably slower than that of Time Machine itself. Also, while you can add items to the program’s list of favorites, I couldn’t successfully remove items from the list. Finally, because Back-In-Time works independently of Time Machine, if you plan on restoring lots of files using Back-In-Time, you should disable Time Machine temporarily so it doesn’t start backing up while you’re restoring.